Setting up this photo was hard work! My husband was a real trooper about working on it with me, and it still took us ages. The snowballs kept falling apart. The eyes are made of whole black pepper. I soaked the toothpicks in soy sauce and black tea to darken them, but they were still hard to see, so I touched them up on the computer. 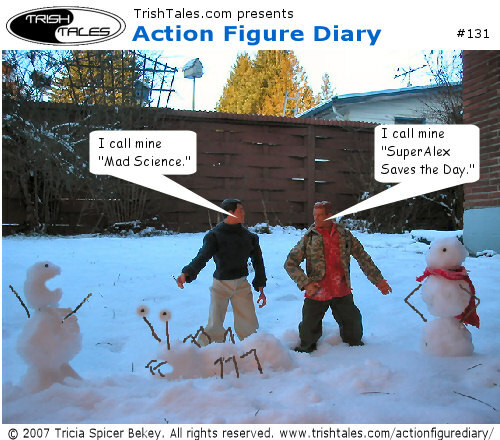 I also took a photo of Jane and Lisa's snow sculptures, which will be next week's comic. I would have expected something more technical and sharp-angled from Brian, because I just can see his snowman shouting "It's alive! It's aliiiive!" ;) But I love sseing the Superalex cape again. Can't wait to see what the girls came up with.